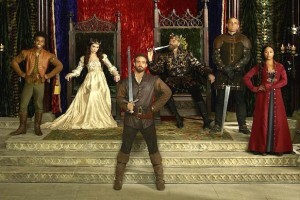 You may or may not already know about Galavant, the ABC TV series created by Dan Fogelman. You may or may not have already checked it out and you may or may not have fallen madly in love with it. Galavant was the first TV series that I ever watched that was entirely a musical; essentially a PG-13 Disney movie about seeking your happily ever after and what happens when it’s a little harder to get to. 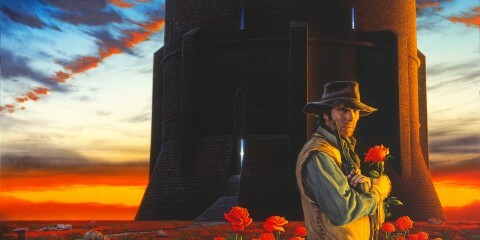 The show is named after our title hero who starts out the first episode by attempting to rescue his beloved. Galavant opens with a big number that sums up the kingdom, Galavant and what’s going on in his life in a mere couple of minutes. Musical montage is the way to go for exposition cause it’s HELLA delightful. So Galvant is off to save his one true love from the evil king who has stolen her away, but just when you think that the show is going to fall into sweet and adorable Disney clichés, it turns everything on its head. From there, the show really starts. And speaking of Disney, the one thing that is straight-up Disney about the show (aside from ABC actually being owned by Disney and therefore actually making Galavant a Disney show…) is Alan Menken, legendary composer who has done the scores for The Little Mermaid, Beauty and the Beast, Aladdin, Hercules, Enchanted, Pocahontas, Tangled, The Hunchback of Notre Dame and more. So like, no big deal or anything. He’s the second most prolific composer in Hollywood, having won 8 Academy Awards (he’s behind Alfred Newman by one award) and he does the music for Galavant. Yeah, that’s super cool, right? Ok, I lied. There’s still more Disney connections to be had here. Dan Fogelman is the series creator and writer of many an episode. Prior to his work on Galavant, he wrote such things as Cars and Cars 2, Bolt, Tangled, and Crazy, Stupid, Love, which makes a lot of sense. Just the right amount of Disney mixed in with the right amount of rom com. It’s really no wonder that Galavant came from this man’s mind. Don’t hold the bit about him writing Cars against him though, Tangled and Bolt were both super great. The cast is absolutely phenomenal and includes a lot of people who you probably haven’t really heard of before, save for former footballer turned actor, Vinnie Jones as the king’s personal bodyguard and BFF. You’ll maybe recognize Timothy Omundson as well, as King Richard (aka your future favourite character with great lines such as “Never start a marriage with a kidnapping!”). Omundson has been in a number of things throughout his career including Starship Troopers, Deadwood, Judging Amy, Jericho, Psych and more. Joshua Sasse plays title character, Galavant, who you’ve seen in nothing you’ve likely invested time in before. Then you have Australian actress Mallory Jansen as Madalena, and delightfully adorable Indian actress Karen David as Princess Isabella. To be honest, it doesn’t matter if the characters are good or evil in the show; they’re all stupidly charming and delightful. Even when King Richard is killing off peasants, you can’t help but love him, which is just another one of the reasons why Galavant is so freaking great. 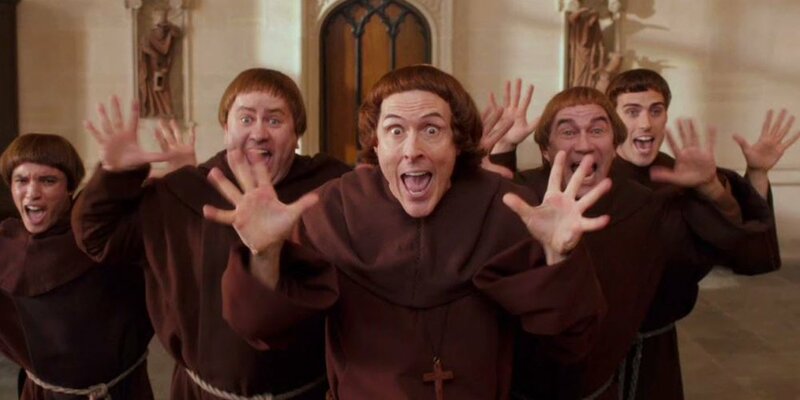 The cameos are KILLER and include John Stamos (as a character named Jean Hamm), Weird Al, Kylie Minogue, Nick Frost, Rutger Hauer, Ricky Gervais, Eddie Marsan (as Death), Matt Lucas, Hugh Bonneville, and SO MANY MORE. But let me tell you, the John Stamos and Weird Al Yankovic cameos were my absolute favourites. If you watch the show for no other reason, watch it for them. The show is basically Robin Hood: Men in Tights meets Once Upon A Time or Ever After. However, it’s closest living relative really is Robin Hood: Men in Tights. Galavant embodies everything from the ridiculous Mel Brooks classic, down to the charming lead. I would even go as far as to say that Joshua Sasse and Cary Elwes very much resemble one another and share an esthetic between them. There are even Mad Men references (what with John Stamos’ character being named Jean Hamm and later having a “boy toy” named Bobby). At this point in my ramblings, I’m not sure if I’m making Galavant actually sound worthwhile, but let me assure that it is. Shows that are clever are often victims of cancellation and this level of wit and charm is on par with TV series’ such as Arrested Development for me. It’s not the same kind of humour, per se, but it embodies what smart television is all about. It doesn’t treat you like an idiot, it gives you what you want but it takes you on a journey along the way. There are only 18 episodes total with a mere 8 in the first season and 10 in the second. The show is delivered to you in sitcom bite-sized portions at 21 minutes per episode, making it super easy to binge watch the entire thing. 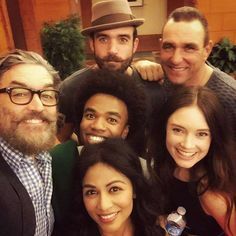 I’m not holding my breath that Galavant gets a third season (although it would be nice) but with the show having such epic talent behind it, I’m weirdly holding out hope that somewhere down the line, it becomes a stage musical. How great would that be!? SO GREAT, RIGHT!? I digress for those of you who haven’t seen the show yet, but stop reading this and go watch an episode immediately. It’s perfect and you’ve been missing out. If you have watched it, do your part now and let ABC know how much you loved it by filling out their feedback form and telling them.